About this time last year, a friend clued me in to a local shop that sells used bike parts. The shop was piled high with a decade's worth of parts. Things I believed to be extinct, BioPace chain rings, steel Ambrosio rims, and all sorts of purple anodized objects were hung on the walls, still in their blister packs. I was looking for a flip-flop hub. I had been commuting on an old singlespeed and I was finally ready to make take the plunge into the fixed gear world. I asked the guy behind the counter if he had any flip-flops. "Here," he said, holding out the hub he had been working on when I walked in. "You want this. I just found it in the back today, but you have to buy it right now. I close in a few minutes and the messengers get paid today. They'll be in first thing tomorrow morning." It was a hub with a modified freewheel on it. I instantly knew it was something out of the ordinary. It looked dangerous, but for some reason I could not resist. I bought it, and he threw in a matching rim. Riding home in the winter night, I wondered if I just fell for a hard sell. Had I found something special, or had I just bought the bicycle equivalent of Jarts, those lawn darts that had a habit of lodging themselves in bystanders skulls? Either way, I knew that there weren't too many of these things left in this world, and maybe I could at least learn something. The hub is aluminum, with forty-eight drillings and a heavy, righthand thread lockring with 'Suntour Dual Free Hub' marked on the outer face. 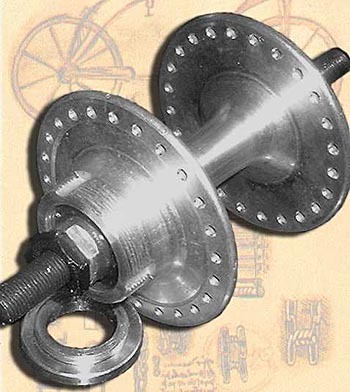 The threading is similar to that of a standard singlespeed hub, but there are also three rounded grooves running through the threads, similar to the splines on a modern freehub. 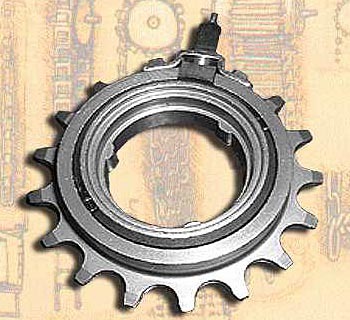 The freewheel itself is marked Suntour 1532. The inner race has two notches opposite each other, each about one half-inch wide. The outer race has a matching notch removed. On the outside of the outer race there is a chrome bracket holding a spring-loaded adjusting screw. This screw pulls a machined bar-stock key in and out of the notch on the inner race. Pull the key out and the freewheel spins freely. 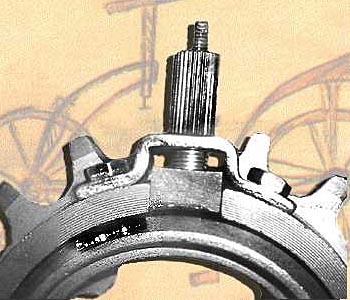 Release the screw and within one rotation you hear a click as the spring-loaded key slips into the notch in the inner race, locking the freewheel. The workmanship is of good quality, and the key tolerances are minimal. I cannot determine whether this is a commercial product, a prototype, or a well-done aftermarket modification. The Sun Chinook 48h tandem rim that the shop owner had given me seemed like a good match. As this was my first wheel build, I plugged hub and rim dimensions into the calculator at WheelCAD and got a three-cross pattern that looked like it would work. I used 15 gauge spokes. The combination of high flanges, zero dish and 48 spokes makes for a different-looking, bulletproof wheel. When I mounted the wheel, I noticed that there was a side benefit to having both fixed and freewheel on one side of the hub--there's only one chainline and one chain length to worry about. I also noticed that the freewheel had a few millimeters of rotational play and about a millimeter of lateral play. That made me a little apprehensive. It was time to give the system a proper test. Riding in freewheel mode turned out to be just like riding a normal singlespeed hub. In fixed mode, the slight play at the hub translated to about half an inch of movement at the pedals. This was most noticeable during track-stands, producing a small lag when I switched pedal direction--but not nearly enough to excuse the fact that my track-stands are just plain clumsy! I grew bolder. I am no lightweight and I am not gentle with my gear. I rode for a year in the city, through winter's gaping potholes, over the mounds of asphalt they pile into the potholes during the summer, along gravel railroad beds, and dirt fire roads. All these miles were clocked on hard 700-23 tires. After half a year, I took the wheel off to see if to see if the freewheel had been knocked out of round. It was still true. I was also concerned about the set screw being exposed, but after many miles I feel confident that is not in any danger. The system does everything it was designed to do. I'm still riding the Dual Free. These days I generally stay in fixed gear mode. Only once have I had a reason to use the freewheel option. That was after ditching the rear brake. I took a quick spin at lunch and my pant leg caught in the chain ring. The right leg ripped right off, smack in the middle of a busy intersection. I quickly switched to freewheel, unwound my pants from the chainring and escaped with everything intact, save my pride and pants. My original plan was to reproduce this beast myself, but after discussing it with a few folks--and learning about the technicalities of case hardening--I abandoned the project. If anyone out there knows anything about the Dual Free Hub, or would like some more information on it, feel free to give me a holler. My address is in the sidebar. Dave is keen to hear from other Dual Free users. Write to him at dms28@pitt.edu. All photos © Dave Simpkins. 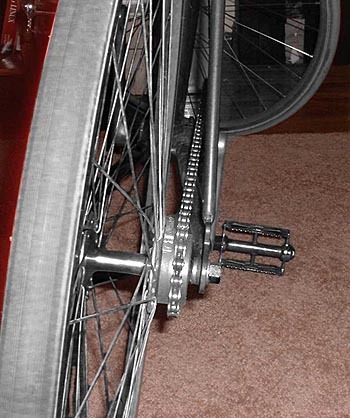 When he built his unusual wheel, Dave used WheelCAD to figure the spoke lengths. The program needs Java and doesn't like Macs.